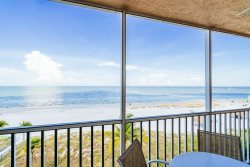 Beach Villas #503 | Stunning Beach & Gulf View from Lanai! Make Memories of a Lifetime! Estero Island Beach Villas #406 will be sure to sweep all your worries away! This end unit is a 2-bedroom 2-bathroom, open concept condo is located on the popular northern tip of the island. Immediately walking through the front door, you are welcomed by the captivating views of the Gulf of Mexico and beach! This fourth level living has beautifully tiled floors throughout, which lead the way to many updated features! The fully equipped kitchen has every amenity needed for an extended stay or a short get away! The master bedroom is furnished with a king size bed, while the guest bedroom has 2 double beds, allowing this unit to accommodate up to 6 people. This condo also includes an in-unit washer and dryer, as well as covered parking to insure a hassle-free stay! Staff was extremely friendly, helpful, responsive. Great all around! A pleasure to work with. Beach Villas 406 is a wonderful condo. Spacious! Plenty of room for 5 adults, very clean, updated furnishings, nicer than I expected! We had a lovely vacation. The only negative is the pool is VERY small. Staff at Beach Accommodations were great.